Oh, how quickly opinions change, eh? Not long ago, Prophets Of Rage were seen as little more than a cynical joke by many, the instrumental section of Rage Against The Machine joined by Public Enemy’s DJ Lord and Chuck D and Cypress Hill’s B-Real to essentially perform glorified karaoke renditions of their own songs. Needless to say, their debut EP The Party’s Over was met with a less-than-stellar response. But then came reports of apparently incendiary live shows, and subsequent original tracks that were a lot tighter and focused than what they had previously tried. It may not have matched up to the legacies of their members’ respective acts, but to see excitement in any capacity for a Rage Against The Machine / Public Enemy / Cypress Hill collaboration in 2017 is still one of the more unlikely occurrences so far. Okay, perhaps “excitement” is a bit too strong of a word. People seem to have learned to limit real expectations for these sorts of bands now, and when the best works of Prophets Of Rage’s collective members include the self-titled Rage Against The Machine album, Public Enemy’s It Takes A Nation Of Millions To Hold Us Back and Cypress Hill’s Black Sunday, that’s less a piece of advice and more a prerequisite condition. Still, Prophets Of Rage’s debut is still a good album in its own right, mainly because of its heavily politicised stance paired with a different tone than usual for a listen that avoids becoming bogged down in a way that so much material in this vein can. That’s perhaps the benefit of this album being more observational than outright critical; the band are aware of very real issues like the issues of poverty in the US on Living On The 110 or just the general tumult of modern life on Unfuck The World, but that awareness doesn’t really come to the sort of biting vitriol that would be expected from an album with such themes in its eyeline. There’s a danger that this tactic can mean straying into ambivalence (perhaps why the final third of this album feels a bit shakier than the rest), but given the reliance on more upbeat, funk-flavoured instrumentation, most negative effects do end up avoided thanks to the band feeling a bit more over-the-top or cartoonish. The pair of vocalists certainly don’t hurt in this regard, with Chuck D positioned as the de facto leader thanks to his deeper, more authoritative tone, and B-Real almost playing the role of sidekick with his more nasal, slippery flows. It’s impressive how each disparate element has managed to fuse so well too, with Tim Commerford’s steady but satisfyingly meaty basslines driving the majority of flows, Tom Morello occasionally given the chance to let out a few more complex guitar squeals like on Unfuck The World, and Chuck D and B-Real riding these mid-paced grooves as if it’s the most natural thing in the world (even if the clumsy opener Radical Eyes is a bit too basic and winds up a bit of a false start). It shifts the paradigm of a political album slightly where the lyrics are in tandem with the instrumentation in terms of importance, and the ratios of each are equalised. Take Legalize Me for example, a pro-weed song where less of a focus is put on verbose language and flows in favour of a fantastically tight disco guitar line that ties everything together in a way that a weaker instrumental wouldn’t. Even better is Take Me Higher, which pitches guitar and bass riffs that are part ’90s alt-rock and part G-funk with lyrics about government drones as if it was the most obvious pairing ever conceived. Of course, this does filter out some of the unfettered anger that all three acts have become well-versed in, but that doesn’t mean it’s gone altogether. There’s a more direct focus of thicker, heavier grooves on Unfuck The World and the customary broadside at Trump on Hail To The Chief, and the militant drum rolls of Smashit pulls the album triumphantly over the finish line after a rather underwhelming third act. But to think, this time last year, few would’ve believed that Prophets Of Rage would be receiving anywhere near as much praise as they have here. What was seen as little more as a throwaway vanity project back then has metamorphosed into a truly competent band peddling their own style both in terms of rap-metal presentation and political focus. 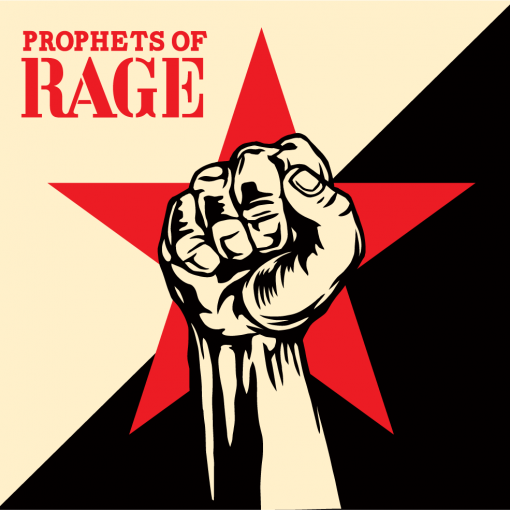 Even with the fact that not everything passes a certain degradation of quality, the fact that Prophets Of Rage have evolved so greatly in such a short time can’t be understated, and there’s no reason that they couldn’t become a genuinely vital project with just a bit of time. ‘Prophets Of Rage’ by Prophets Of Rage is out now on Fantasy Records.